Tough Quality Rugby. Living with the expectations! ‘Although not quite at his ferocious best in the loose at the Millennium Stadium against England, Ryan Jones’ leadership skills are growing by the game. The Wales skipper kept his troops calm as England tried to turn the screw, and was a tremendously reliable option in the line-out. “It was the best I have heard him speak in the changing room before the game.” Wales coach Warren Gatland on Jones’ pre-match team-talk’. He is more demanding of himself. 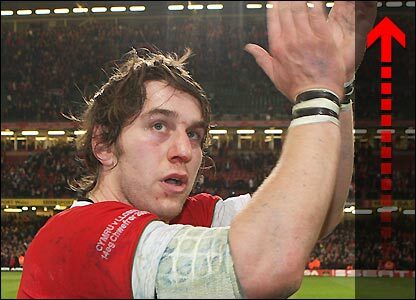 The Swansea-born player revealed he thought his rugby career “was over” when he was released by his home region the Ospreys in 2007. And Twinkle Toes – Shane Williams is declared fit!! All this on my door step!! How lucky am I?? Which of the 6 Nations Rugby games excites you the most? This entry was posted on Wednesday, February 25th, 2009 at 2:34 am	and is filed under Social. You can follow any responses to this entry through the RSS 2.0 feed. Both comments and pings are currently closed.